2019 has started and what a start we’ve had! At our first rehearsal we were welcomed to the sport hall by a red carpet leading up to our own back-drop and roll-up banner where we had our pictures taken, as if we were stars on our way to a gala receiving an award. Later on our eminent directors danced their way in, singing Proud Mary with the new lyrics “Hat-trick! Hat-trick! Want to do a hat-trick!” If that start didn’t lift the roof we also got special member cups from our marketing and social committee; black cups with our new logo printed with gold letters. Perfect for tea or coffee. A number of other items will soon be available in our web shop – stay tuned! We're a huge chorus - 153 active members and still growing. So here's a closer look on some of us! 1: mother and daughter Gunilla (lead) and Karin (baritone): 2: quartet pals Eva (bass) and Ann-Louise (lead) and 3: sisters Linda (lead) and Lena (baritone). See more photos and presentations on our facebook page. This year we’ll focus on our participation at the International Competition New Orleans. Every rehearsal will take us one step closer to our goal doing a hat-trick, scoring gold third time in a row. To practice and prepare us for New Orleans we will of course sing, and we will also be sweating - a lot. After our first rehearsal with Jan Alexandersson, our fabulous choreographer, both the front row and the rest of the chorus on the risers were exhausted, and maybe a even a bit confused. But there’s no doubt our final package will have an amazing choreography. We’ll just have to do a lot of drilling on that part. Of course we also got new songs to learn. Not one song, not two songs, not even three songs. Let’s just say that there are alot of songs to learn for our final package. Maybe you’ll get a glimpse of them in the future. One of our biggest challenges with our songs this year will be to sing them at A+ level and not to sing them as we’re used to when we’re in the shower or on the subway. Our hope is that you want to accompany us on our journey - before, during and after New Orleans. This blog will therefore be part of our way to share what we’re doing including all the laughing, sweating, tears and of course singing. Rönninge Show Chorus is known for their hats contributing to the unifying look of the chorus when competing. 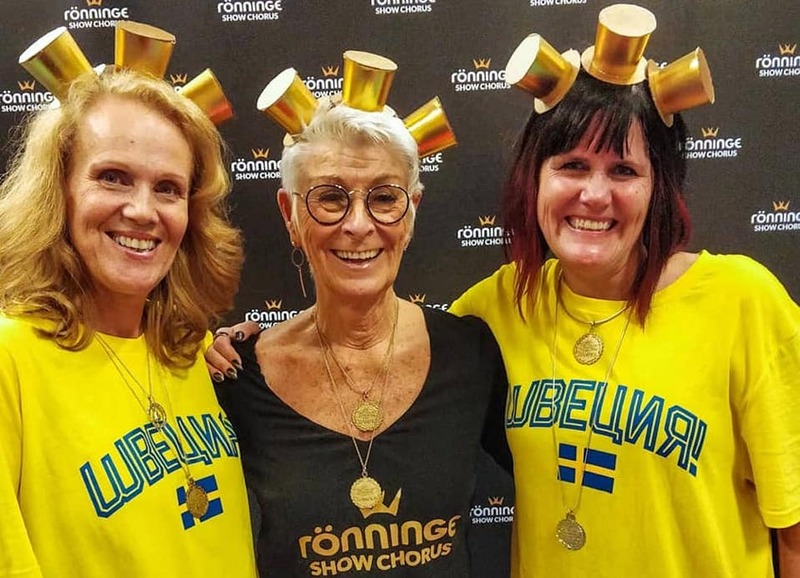 The three directors Anna-Lena Rickardsson, Britt-Heléne Bonnedahl and Anna Alvring was surprised with specially made hats at 2019 kick-off: let's do a hat-trick.